Updated June 3, 2013. Caphyon’s Aura Dozescu was kind enough to provide solutions to the ‘Cons’ and ‘Future Suggestions’ mentioned in the review. Thanks Aura! Special mention & thanks goes to fellow SEOs at Powered By Search, Trang Lam – for handling all of the outreach for this post, and Troy Boileau – for behind-the-scenes help. A significant part of any SEO’s job is tracking the rankings of their clients’ keywords in search engines. After all, for many SEOs and their clients, a website’s position in the SERPs is a very important KPI that reflects the visibility of a website and potential for traffic. It also serves as a measure of SEO performance and acts as a constantly moving measuring stick for gauging whether SEO efforts need to be ramped up and to what degree. Here at Powered By Search, our tool of choice for tracking the rankings of clients’ keywords is a tool called Advanced Web Ranking (or AWR). It’s a powerful and very user-friendly tool that we use on a daily basis as well as in our monthly client reports. We felt that it would be a good idea to review Advanced Web Ranking and share some of our thoughts, as well as reach out to other SEO experts in the industry for their opinions, so that we can help fellow SEOs decide if this is the ranking tool for them. Hopefully after outlining some of the features, pros, and cons of AWR, you will find your answer. Advanced Web Ranking is an SEO software suite created by Caphyon Ltd., that primarily focuses on the tracking, management, and reporting of website rankings on all major search engines. It allows you to manage an unlimited number of projects, websites, and keywords from the research stage to day-to-day tracking. This flexibility makes AWR extremely useful for individuals and SEO agencies alike. Aside from the main rank tracking functionality, AWR also includes a number of highly useful SEO tools including Google Analytics and Google Webmaster Tools integration, as well as tools for website auditing, competitive research, and keyword research. Advanced Web Ranking is available for Microsoft Windows, Mac OS X, and Linux. It is sold under a lifetime license and is available in a few different versions, each with varying features. The basic “Standard” version is available for $99, while the fully featured agency-grade “Server” version starts at $1499. The pricing page on AWR’s website fully breaks down the features and functionality of each version, and can be found here. If you’re worried about spending money up front, you’ll be happy to know that the tool is available for a 30 day free trial that includes complete and unrestricted access. Try it out here! Advanced Web Ranking is packed full of useful features for SEO professionals and wrapped up in a very user-friendly interface. If you’re unfamiliar with the tool, a brief breakdown of what it offers is provided below. 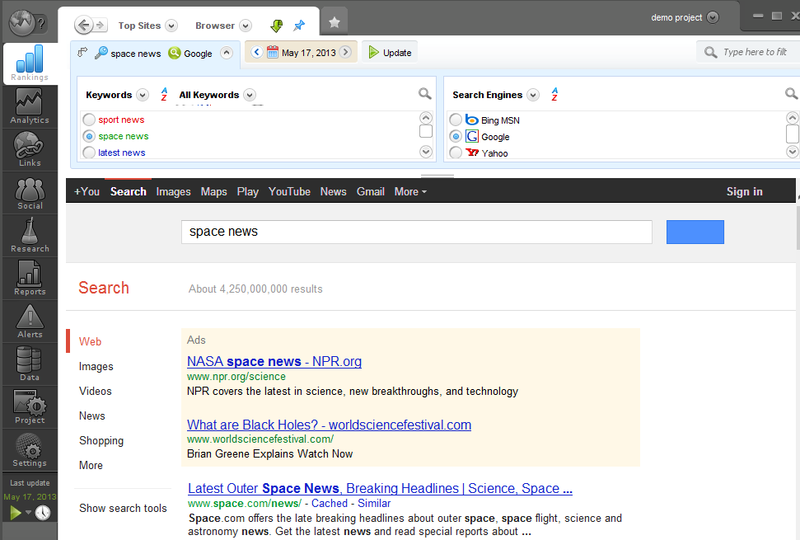 When you first launch Advanced Web Ranking, you’ll be greeted by a very clean and straightforward user interface. On the left sidebar you will find navigation to all the different modules of the tool, then in the main window you’ll find the core functionality of your selected module, whether it’s keyword rankings, research tools, or settings. Along the top of the main window you’ll find drop down menus that give you access to the different sub-areas of each module. Also throughout the tool, most functionality is easily accessed and toggled through various drop down menus, checkboxes, and radio buttons which all contribute to a straightforward and streamlined workflow. Likely the most used module in Advanced Web Ranking is Rankings. 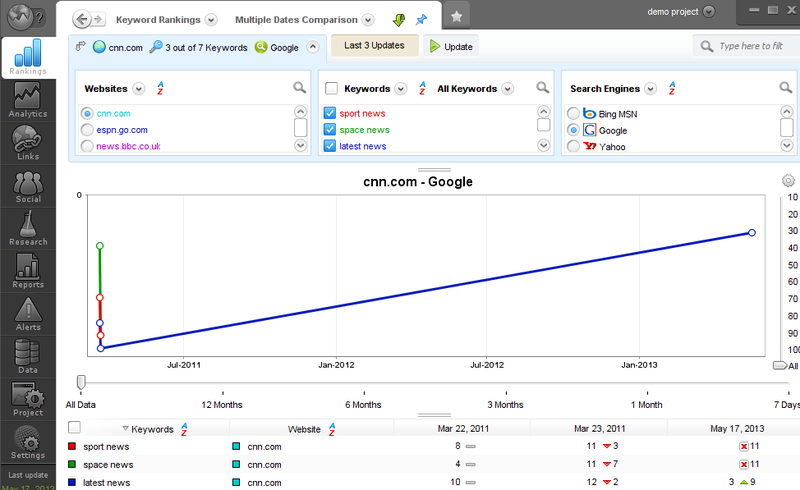 Here an SEO can access AWR’s core features and track & manage the keywords & rankings of clients. The module is highly customizable and can show you anything from the current, previous, & best performances for keywords to the number of local monthly searches and keyword competition, and much more! You can view reports that show you the visibility of a website in search engines as well as others that will tell you the position of a website for individual keyword queries in the SERPs. These reports can be run manually or automated. The Analytics module allows you pull Google Analytics data directly into the tool, saving you from having to access website every time you want to check your client’s website traffic and on-site activity. Similar to Google Analytics, you can view metrics on visits, bounce rates, time on site, traffic sources, and goal completions, for example. To enable this, you simply link your Google Analytics account with the respective project in AWR. This Google Analytics data also integrates with Advanced Web Ranking’s other modules, allowing you to attribute visits to specific keywords, for example. Advanced Web Ranking can also report on the backlink profile of your client’s or their competitor’s website with the Links module. It pulls in authority metrics from Moz and MajesticSEO, as well as a count of the number of backlinks and linking root domains, among others. With AWR, you can run updates on these metrics over time and compare them to help you manage your link building efforts. AWR also includes unique and useful link reports such as Hub Sites, which compares client and competitor websites and looks for shared backlinks, and Links Distribution which shows the distribution of a backlink profile based on authority metrics. The Social module allows you to keep track of a website’s activity on Facebook, Twitter, and Google+. This includes tracking the number of shares across these social networks, as well monitoring related Twitter and Facebook pages to the particular website. A great feature in AWR is the ability to track social performance over time. For instance, you can chart out changes to social shares and follower counts. The Research module in AWR includes a number of useful tools for gaining insights on your client’s website, their potential & current keywords, and your competitor’s situation as well. The tool include a website auditor that evaluates the on-site SEO performance of a website, keyword-based tools that will help you discover and analyze keywords for your client (and integrates with keyword tools such as Google Adwords, WordTracker, and SEMRush), and tools for seeing how search engine spiders view a website. AWR’s Reports module is a very robust, yet easy-to-use tool for creating reports for clients or your own personal needs. 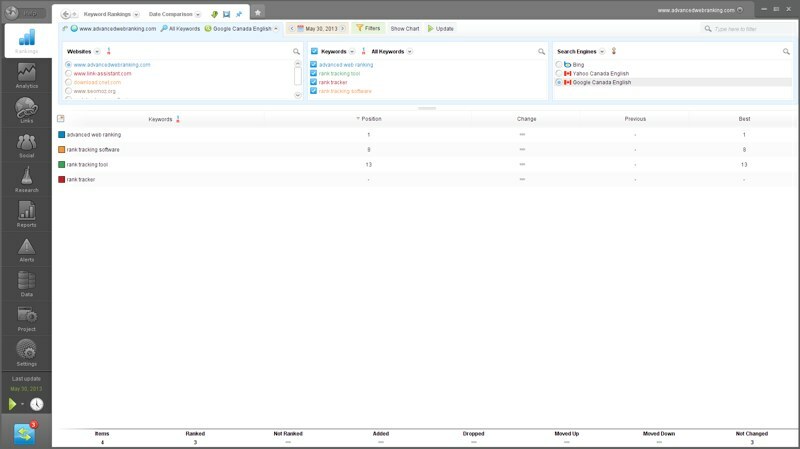 You can generate reports covering nearly every functionality of the tool, including rankings, analytics, backlinks, and on-site audits. A few great features of Advanced Web Ranking’s reports is that they are highly customizable, you can export them in a variety of formats (i.e. PDF, CSV, HTML, etc. ), and they can be scheduled and automatically emailed as well. Advanced Web Ranking’s Data module is for administrative use, and allows you to manage the data that the tool has either collected, or data that you wish to add. The data module also includes a feature to backup and restore projects. From this module you can do a number of things with the data contained in AWR. For example, you can import existing data, such as a CSV file of keywords, you can export data from AWR to CSV or XML files, and you can remove specific data ranges as well as reset entire projects. In the Projects module of AWR you are able to create and alter all of your projects, which are tied to an individual website URL (typically one belonging to a client). From this module you can define which websites (such as those of competitors) belong to the project in addition to the primary website, add or edit keywords tied to the project, and set project-specific settings such as client email addresses. The Settings module is fairly self-explanatory – it’s where you can find all of Advanced Web Ranking’s global settings. A few interesting settings however are Users and Groups, where you can control individual user access to specific projects, and the Performance Settings, which control how AWR connects to the Internet to retrieve data for ranking, links, & research reports. In the Settings module you will also find Proxy Settings. Proxies are very important to add to AWR so that you don’t bombard search engines with queries from a single IP address, as it will result in errors and warnings. The proxy function of AWR is widely well received for its ease of use, since proxies can be imported and testing in little more than a few clicks. What Do SEO Professionals Think About Advanced Web Ranking? “I’ve used AWR for tracking a lot of keywords – often up to 10,000 keywords at a time. It does a great job of handling the high volume of keywords that I needed to process and was pretty easy to use. Exporting ranking data was really convenient for my ranking reports. Another great feature was the ability to use proxies very easily. As for myself, I simply use AWR on a regular basis to keep track of my client’s keyword rankings. I run multiple updates per week for my own use, and every month prepare a report for my clients comparing rankings over the past 30 days. It’s far more convenient that doing manual checks, and I do like the fact that I can always go back and compare current rankings to past ones. However, after creating this post, I do think that I will definitely be spending more time with all the other modules and features that AWR has to offer. The weekly (and sometimes greater) frequency of updates and bug fixes to AWR got a lot of praise from Vlad, with him mentioning it as a big reason why he likes the tool. Chris also mentioned in his previous quote that he really appreciated the fact that Advanced Web Ranking is available for a one-time license fee. This is unlike many other SEO tools where there is often an associated monthly subscription fee. AWR’s user interface received praise from nearly every SEO that we got in touch with for this post. There were thoughts from Chris and Vlad on how easy the tool made it to find all of its features and make seemingly difficult tasks like setting up proxies very easy. Personally, when I first started using AWR it took an instant to learn how to use the tool, and that’s a sign of great design for sure. After spending some quality time with AWR, I also agree that the all-in-one nature of AWR is a great feature. Especially since data and metrics from different tools, such as Google Analytics or Moz data can be attributed in keyword ranking reports. The ease of setting up proxies in AWR was mentioned by both Geoff and Chris. Chris appreciated the fact that in combination with the user interface, a very difficult process is made much less daunting. With proxies being such an important part of AWR’s functionality, it’s good to know that it can be configured in no time at all and without issue. AWR’s ability to track keywords was well regarded by Chris and Geoff, especially the fact that there is no limit on how many can be tracked (Geoff often tracks up to 10,000!). Especially with AWR’s ability to import lists of keywords and automate updates, it certainly makes keyword tracking a very straightforward and worry-free process. Both Vlad and Geoff are fans of AWR’s reporting features, with Vlad noting that he found the reports to be far superior to those of any other tools, and Geoff appreciated the convenience of exporting ranking data for his reports. 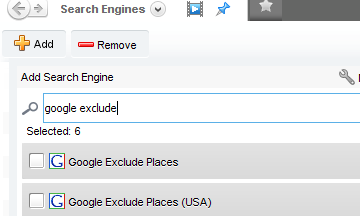 Aura Dozescu, Online Marketing Strategist at Caphyon Ltd. says, “if you want to exclude the local listings that Google blends with organic results, you can use the ‘Google Exclude Places’ search engines,” as shown in the screenshot below. “Another great feature for AWR would be if they started to archive the SERPs for the keywords being tracked for a given client so that one would be able to go back and check the SERPs for those keywords during any of the days an update was run. This would allow agencies and clients to keep track of major search engine algorithm updates and see how their own clients’ and competitors’ rankings have shifted after the algorithm updates. Caphyon’s solution is provided above. Zain Husain, an SEO Specialist here at Powered By Search would love to see more keyword-based tools built into Advanced Web Ranking. 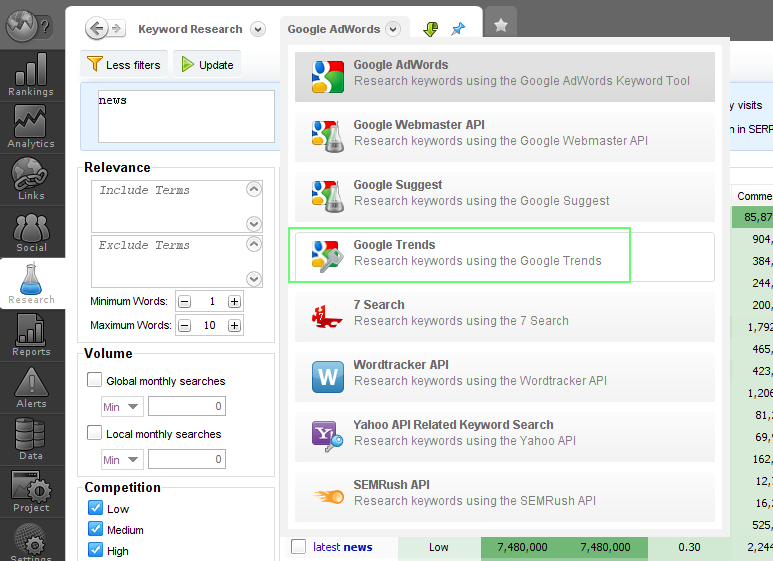 “I would like to see more tools with keyword research that would be built in. As it is a ranking program it would be great to see it extend its functionality to include capturing trending keywords or rising keywords (like Google Insights). Based on personal experience and the thoughts of SEO professionals, the overall sentiment towards Advanced Web Ranking is generally very positive. The user interface and ease of tracking keywords, generating reports, and managing proxies definitely appear to be the standout highlights of the tool, as well as the one-time license fee. On the other hand, the tool isn’t perfect, and there are some issues with the scalability of the tool as well as its current inability to separate organic and local results in ranking reports. Overall however, it’s generally agreed that AWR is a great rank tracking tool for small- to medium-sized clients. Since this is a review post, I suppose it calls for a final score. With respect to Vlad’s request for numerous smiley faces to be included in the post that I’ve yet to truly honour, I will give Advanced Web Ranking 4 smiley faces out of 5. A personal thank you goes out to all the awesome contributors that kindly offered their thoughts on Advanced Web Ranking. And an extra special thank you to Trang Lam for taking charge of handling all the outreach for this post. Here’s how you can get in touch with all the contributors on social media!